Difference between revisions of "Services API"
The '''Video''' service is used to query and modify video metadata, look up metadata, add new videos to the library, and other video-library-specific functionality. The Services API is a new set of APIs (Application Programming Interfaces) taking the place of MythXML in MythTV versions .25 and later. 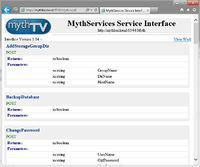 It is an extremely featureful set of interfaces designed to allow one to configure MythTV, access MythTV content, control your DVR, use MythTV as a service in your own applications, and otherwise make MythTV accessible to any and everyone. The Services API uses regular HTTP POST and GET commands, and can return both JSON and XML output by setting the HTTP accepts header appropriately. The Services API is organized into services, which are logical groupings of APIs by their function and purpose. The individual methods contained in each service are documented on the service's wiki page. Because this is not a valid API. Individual APIs may also do their own sanity checking regarding required parameters, acceptable values, and other basic requirements. It is good practice (per HTTP 1.1 standard) for those APIs which change data or trigger an action (capture card creation, settings changes, etc.) to be POST only. If you find that an API is not working, it is likely because the MythTV developers want you to think very carefully about how you use it, and it requires you to HTTP POST the data. Warning: All DateTime formats in the services API are in UTC. Regardless of the timezone of your frontend or backend, the dates produced by the APIs will be UTC. Likewise, all inputs to the API must be in UTC. While it is possible to call most if not all of the APIs from a browser, the true power of the system is exposed when they are used programmatically. You might choose to wrap the API library in a C, Java, Cocoa, or other wrapper so that all of this functionality can be used from a program of your own. You might choose to write an alternative frontend (that won't break every time the protocol or database schema changes), a web interface, or your own setup application! If you navigate to the url using a browser that supports XSLT, you will be presented with a web page showing each method and parameters. The real power comes when you supply the url to a web service proxy tool. It will take the WSDL and generate proxy classes that allow you to call the service methods in a way that is native to the tool/language you are using. You can click the title of any service to see documentation on the individual APIs.